In this tutorial, we will cover how to install Graylog v1.3.x (sometimes referred to as Graylog2) on CentOS 7, and configure it to gather the syslogs of your systems in a centralized location. Graylog is a powerful log management and analysis tool that has many use cases, from monitoring SSH logins and unusual activity to debugging applications. It is based on Elasticsearch, Java, and MongoDB. It is possible to use Graylog to gather and monitor a large variety of logs, but we will limit the scope of this tutorial to syslog gathering. Also, because we are demonstrating the basics of Graylog, we will be installing all of the components on a single server. This tutorial will implement a very basic Graylog setup, with all of the components installed on the same server. For a larger, production setup, it is advisable to set up install the components on separate servers for performance reasons. The setup described in this tutorial requires an CentOS 7 server with at least 2GB of RAM. You also need root or superuser access (Steps 1-4 of Initial Server Setup with CentOS 7). If you use a VPS with less than 2GB of RAM you will not be able to start all of the Graylog components. MongoDB should be up and running now. Let's move on to installing Java. Now that Java is installed, let's install Elasticsearch. Graylog 1.x only works with pre-2.0 versions of Elasticsearch, so we will install Elasticsearch 1.7.x. Elasticsearch can be installed with a package manager by adding Elastic's package source list. Now that Elasticsearch is up and running, let's install the Graylog server. Now that we have installed the other required software, let's install the server component of Graylog, graylog-server. You should see that password_secret and root_password_sha2 have random strings to them because of the commands that you ran in the steps above. Save and quit. Now graylog-server is configured and ready to be started. 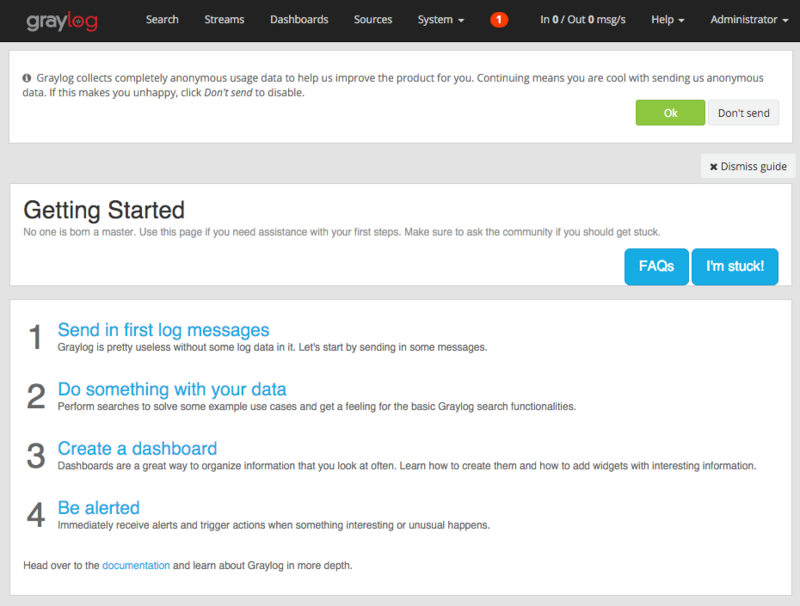 The next step is to install the Graylog web interface. Let's do that now! Now we need to update the web interface's configuration to specify the graylog2-server.uris parameter. This is a comma delimited list of the server REST URIs. Since we only have one Graylog server node, the value should match that of rest_listen_uri in the Graylog server configuration (i.e. "http://127.0.0.1:12900/"). 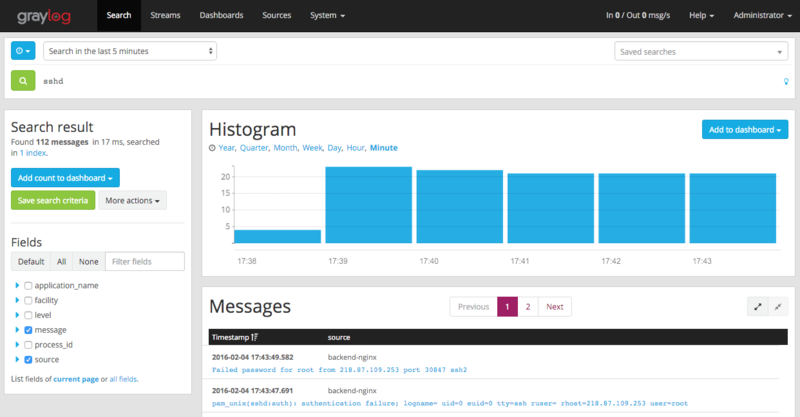 Now we can use the Graylog web interface. Let's do that now. You should see a login screen. Enter admin as your username and the admin password that you set earlier. The red number at the top is a notification. If you click on it, you will see a message that says you have a node without any running inputs. Let's add an input to receive syslog messages over UDP now. To add an input to receive syslog messages, click on the System drop-down in the top menu. Now, from the drop-down menu, select Inputs. Select Syslog UDP from the drop-down menu and click the Launch new input button. Now our Graylog server is ready to receive syslog messages on port 8514 from your servers. Let's configure your servers to send their syslog messages to Graylog now. On all of your client servers, the servers that you want to send syslog messages to Graylog, do the following steps. After you are finished configuring rsyslog on all of the servers you want to monitor, go back to the Graylog web interface. Click on Sources in the top bar. You will see a list of all of the servers that you configured rsyslog on. The hostname of the sources is on the left, with the number of messages received by Graylog on the right. Searching through data in Graylog is useful, for example, if you would like to review the logs of a server or several servers after an incident has occurred. Centralized logging makes it easier to correlate related incidents because you do not need to log into multiple servers to see all the events that have happened. Now that you have Graylog set up, feel free to explore the other functionality that it offers. You can send other types of logs into Graylog, and set up extractors (or reformat logs with software like logstash) to make the logs more structured and searchable. You can also look into expanding your Graylog environment by separating the components and adding redundancy to increase performance and availability.